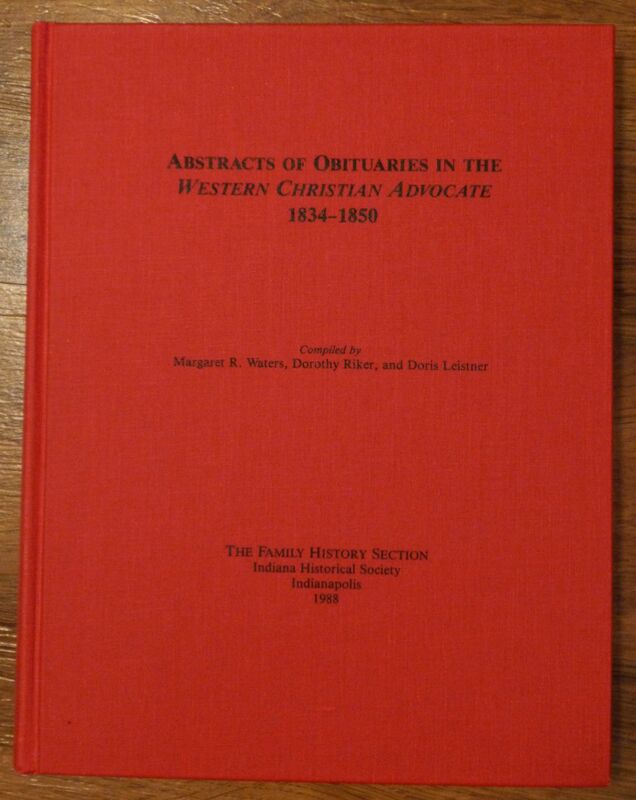 I was doing a little spring cleaning and trying to reorganize my office when I came across a book that I forgot I had, Abstracts of Obituaries in the Western Christian Advocate, 1834-1850. It was compiled by Margaret R. Waters, Dorothy Riker, and Doris Leistner, copyright 1988, Indiana Historical Society. It took a lot of research and hard work to compile this interesting and informative book that is indexed and very well organized. As Methodism spread westward there was a need for a newspaper to provide for those in the Midwest. 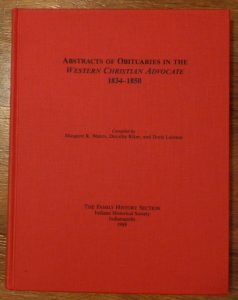 The Western Christian Advocate was established in 1834 for this purpose and each issue consisted of four standard-size newspaper pages. News consisted of obituaries, some marriages, general news items, medical information, temperance and missionary news, Methodist meeting reports, sermons, and denominational concerns. Obituaries were not limited to only Methodists and most of the deaths reported were from Kentucky, Ohio, Indiana, and other Midwestern states. The paper had a circulation of 14,000 in 1840 and 18,000 by 1850. It was published until 1929. I looked through the index and found some obituary abstracts of individuals from our area. I noticed places such as Deep Cut and Duck Creek were specifically mentioned, likely because there was a Methodist congregation in those areas. Also note that St. Marys was still part of Mercer County until 1848. Below are a few local obituary abstracts. GRAY, Eliza Jane, b. 16 August 1804 in Virginia, d.15 August 1849 at her residence near Wapakoneta, at the age of 45. Her parents were William & Catharine McGee and the family moved to Kentucky when she was 12 years old. She married Samuel Gray on 28 March 1819 and they moved to Miami County, Ohio, in 1827; to Mercer County, Kentucky, in 1832; and to Auglaize County, Ohio, in 1838. Her husband survived her and they had children, but they were not named in the obituary. DELLINGER, Susannah, born in Fairfield County, Ohio, died 17 July 1847 in [Deep Cut] Mercer County, Ohio. Her parents were William and Susanna North. She married Samuel Dellinger on 20 April 1835. She was survived by her husband and 2 small children. COUNTERMAN, Mrs. Elizabeth, died in 1 January 1843 at the age of 23 [Duck Creek]. She was married to Jacob Counterman. FLAGG, Samuel, born September 1772 in Boilstone, Massachusetts. He died January 1843 [Duck Creek]. In 1800 he lived in Berkshire, Franklin County, Vermont. DUTTON, Mrs. Elizabeth, died November 1840. She was married to Jonathan Dutton. DONLEY, Mary, born in Lancaster County, Pennsylvania, died 9 March 1839 in Mercer County, Ohio. She came to Ohio in 1818. GLINKLE, Mrs., born in New York, died in Mercer County, Ohio. She was married and had a family. Her death was in the 26 January 1844 issue. HARPER, Mrs. Catharine, born 20 May 1795 in Westmoreland County, Pennsylvania, died 8 November 1841 in Mercer County, Ohio. Her parents were John and Catharine Martin. She married Joseph Harper on 3 September 1813. They had a daughter Margaret who died 20 December 1841. She lived in Venango County, Pennsylvania, at one time. HOLLINGSWORTH, Deborah, born in Jackson County, Ohio, and died 8 October 1844 at St. Marys, Mercer County, Ohio, at the age of 33 years. She was the daughter of Cuthbert and Deborah Vinson and they moved to Mercer County in 1825. She married William Hollingsworth in 1834 and they had 3 children. JONES, Charlotte, died 19 April 1837 in Mercer County, Ohio. She was the daughter of Samuel and Ruth Johnson. She was the wife of JB Jones and they lived in Dayton, Ohio. LATTIMER, Esther, born 26 August 1796 in New York state. She died near St. Marys, Mercer County, Ohio, on 5 August 1844, at the age of 48. She moved to Medina County, Ohio, in 1826, and to Mercer County, Ohio, after her marriage to William Lattimer, which was on 20 October 1842. MERLIN, Lydia, died in Mercer County, Ohio, on 21 May 1849 at the age of 41. She was married to William Merlin. MORE, James, born in 1786 in Virginia, died 21 October 1839 in Mercer County, Ohio. He moved to Madison County, Ohio, about 1809, to Franklin County, and finally to Mercer County. POWERS, Margaret Jane, died in Mercer County, Ohio, on 20 December 1841, at the age of 20. She was the daughter of Joseph and Catharine Harper and was married to John Powers. ROEBUCK, Benjamin, born in Virginia, died 17 December 1842 in Mercer County, Ohio. He moved from Virginia to Ross County, Ohio, in the early 1800s. He had children who were not named in the obituary. ROEBUCK, Greenley, died in Mercer County, Ohio, on 28 December 1841 at the age of 26. He was the son of Benjamin Roebuck and was formerly from Fayette County, Ohio. ROEBUCK, Sarah, born in South Carolina, died 11 December 1842 in Mercer County, Ohio. She was past 50 years of age. She was a widow and her husband died about a year before. She had 11 children, 1 died young and 2 sons were deceased. She moved from Fayette County, Ohio, 24 years ago. UPTON, Margaret, born in Hardin County, Kentucky, died in Mercer County, Ohio, on 20 June 1845, at the age of 25 years. She married Thomas Upton on 21 March 1839 and they moved to Mercer County shortly after their marriage. They had 4 children. WATTS, James, born 1787 in Baltimore County, Maryland, died in Mercer County, Ohio, on 24 January 1843. WRIGHT, Able, born 1765 in Shenandoah County, Virginia, died in Neptune, Mercer County, Ohio on 17 March 1848, at 83 years of age. He moved to Clinton County, Ohio about 40 years ago and later to Mercer County. WRIGHT, Mrs. Mary, died in Mercer County, Ohio 3 August 1840, at the age of 75. She was married to Able Wright. WRIGHT, Wealthy, born in Whately, Massachusetts, died in Mercer County, Ohio on 3 September 1845 at the age of 60. She was the daughter of John and Jane Smith and they moved to western New York when she was young. She married James Wright in 1805. I will print a few more local obituary abstracts from the Western Christian Advocate next week.